A MAN of 30 received head injuries in a collision with a cyclist at a pedestrian crossing in Dalston on Wednesday 6 June 2012. In Clapton today another man was badly hurt. The bicycle incident occurred near a McDonald’s store in Kingsland High Street, London E8 2JP. 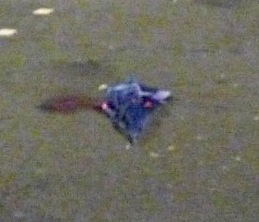 The victim was taken to the Royal London Hospital in Whitechapel E1 1BB. Police cordoned off the area and photographed the scene. In Lower Clapton Road on Thurs 7 June 2012 a man in his sixties was taken to the Royal London with head injuries. Early this year a pedestrian was injured at the new crossing near the CLR James library. Walkers have to wait 90 seconds for the green lights, much longer than has been traditional at London crossings. As a responsible cyclist (OK, a “granny cyclist”) and pedestrian, I am increasingly bothered by the reckless behaviour of many cyclists, on roads and, even more so, on towpaths. I don’t know who’s to blame in the story above, but a cyclist hit a pedestrian and the pedestrian was badly injured. Maybe it’s time we/they got numberplates. So far as I know, the law has not determined who, if anyone, was at fault. — Ed. Yes, that was mentioned by the article to which I referred. At this stage of my enquiries, I am not able to be specific about the E8 incident. — Ed. I guess I must have passed by McDonald’s just after you had taken the photo and I too saw the large pool of blood and broken umbrella at the pedestrian crossing. It was a chilling sight. Incidentally, you refer to it as a traffic “accident”. I understand that the appropriate term to use nowadays is “incident” because “accident” implies that no one was at fault and, when it comes to motor traffic casualties, invariably someone is at fault. You state that the new crossing near the CLR James library has a walk period of 90 seconds. This is welcome news but I wonder how recently you measured this time. I was crossing it a few months ago with a BBC journalist and the two of us nearly got hit by cars when the lights changed after about nine seconds. Luckily, she caught the close call on her audio recorder: http://www.bbc.co.uk/programmes/p00n3tbf#p00nrf4y (item no 2). I read a discussion on terminology (The Guardian?) but I found the piece confusing. In my article, I wanted to avoid prejudicing the interests of anybody involved in the, uhm, incident/accident. Your point about walk time has made me amend the piece and I hope it is clearer. Talking of the library pedestrian crossing, the number of times I see people tire of the long wait for green and weave their way through moving vehicles is frightening.